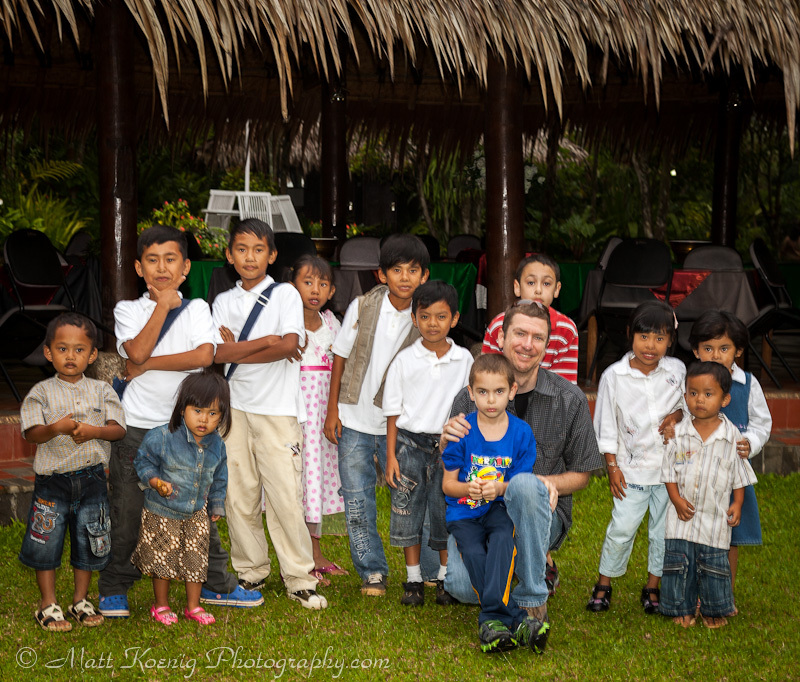 We celebrated Christmas with some villagers here in Indonesia. These kids were so great. I woke this morning in Indonesia to learn of the tragic school shooting in Connecticut where 28 people were killed, 20 of them being children. My first reaction was disbelief although I don’t know why. Just a week ago was a tragic shooting at a mall in my home state of Oregon. There was the Batman movie shooting in Colorado not long ago. Virginia Tech still comes to mind. Oslo Norway springs up. After disbelief came anger thinking about the crazy person who took the lives of so many needlessly. Anger that so many families are affected so tragically at a time when Christmas joy should ring out instead of gunshots. Anger lead to sadness which is where my mind lingers now. All day I thought about this senseless act. Why? I walked to the local store today to buy some things to make French toast for breakfast. As I walked I crossed paths with so many different people all smiling and greeting each other with Selamat pagi! (Good morning). I saw kids playing in the streets. Where were their parents? Why wasn’t an adult keeping an eye on them? I remember my Mom telling me about a time when she had no fear letting me walk by myself to the store. I remember growing up and riding my bike miles at a time without any fear. My friends and I would spend all day out and about having fun. Our parents didn’t worry too much. Today I wouldn’t think of letting my two boys run around without an adult nearby. Today I feel anxious when they are in school wondering if an event like that which took place in Connecticut could occur at my kids school. These thoughts are in the back of my mind even as I try and comprehend this tragedy. Could something like that happen here in Indonesia? Life is definitely different here in Indonesia. The people I have met have been so welcoming and friendly. Traffic is horrendous and yet I have not seen one incident of road rage or a single middle finger raised, and when you need help people seem to come out of nowhere to lend a hand. It’s a different pace of life. I don’t get the sense that things are rushed. I could be wrong about a lot of things here but these are my own observations and feelings. There are plenty of problems here as well. There is poverty and inequality just as in any other nation, the United States included. There is pollution here and the streets are often dirty. There is religious intolerance and persecution. These are not issues unique to Indonesia. I think what we have to start realizing is that we are not solitary vessels floating around at sea. We are all connected in one way or another and we are all in the same story. Our parts may be different but the story is the same. A little compassion, empathy and grace goes a long way to creating a better community, a better state, a better country and a better world. Since arriving here in Indonesia and experiencing everything I have so far I’ve started to question my life. What is it all about? Why am I here? How can I make a difference? I wonder how I will ever be able to go back and sit in my tiny sheltered cubicle again. It all seems so foreign and distant like a bad nightmare that slowly fades away leaving just a fog of thought lingering on the edges of my mind. These recent tragedies have made me think about life, how fragile and quick it is. We always talk about making the most of things, living each day as if it were your last, living our dreams; the clichés go on and on. And yet we don’t act on them. They make us feel all warm and fuzzy in the moment but we never follow through. Maybe we think we will always have time; that something like this tragedy could never happen to us. It only happens to other people. What if we’re wrong? Life is short. We can’t afford to be wrong. I’m not sure what I am trying to say here. My thoughts are jumbled today and running all over each other. Maybe this post is more for me than anyone else, just to get some thoughts out and make room for some reasoning and further thinking. I just can’t help but think that my life has to change. To return to everything I knew just seems wrong. I want more than the tired American Dream. The stuff be damned. I can live without the big TV, the fancy cars, the big house with a white picket fence. All of that just enslaves you. I’ll take the simple life filled with memorable and unforgettable experiences that last a lifetime instead of eventually ending up in a landfill. I want to spend more time with my wife and kids. I want to travel and experience the world more. I want to feel passionate about the work that I do. I want to make a difference in the lives of people I meet. I knew this sabbatical would be life changing. I just didn’t know how it would unfold. I still don’t. Maybe it’s just me but we all seem to be waiting for something to change. We wonder how events like this could happen. And yet we never become the change we want to see. Instead of waiting for change to happen maybe we need to change ourselves rather than waiting for something to happen. Coming up this next week is a post detailing our finances for the first month of our sabbatical. How much have we spent and what did we spend it on? If questions about finances have been holding you back from taking a sabbatical you should definitely check this post out. Wonderful piece of writing – really from the heart stuff. There’s not much I can add – you touch on so many points – I feel like we could discuss this stuff all day long. Best wishes from the UK.